Just a few years ago, the status of Indiana’s basketball program had never seemed more dire. Legendary coach Bob Knight was expelled in a fit of campus fury; Mike Davis’ faltered tenure unraveled within years; and Kelvin Sampson conference-called the Hoosiers to a place they had never been before — the NCAA sanctions doghouse. Indiana was a blue blood, sure, but what if those days were gone? What if the Hoosiers’ time had passed? Those anxious existential quandaries are now the furthest thing from any IU fan’s mind. Tom Crean deserves the lion’s share of credit for that, in large part because he followed the recruiting blueprint required of any Indiana coach, forging alliances with the state’s top coaches and figureheads and, beginning with Cody Zeller, convincing the in-state talent (or most of it, anyway) to stay in the state. Meanwhile, not enough can be said of Indiana’s new Cook Hall, a 67,000-square-foot facility that not only serves as the headquarters for the program and its players but also hosts a veritable museum of Hoosiers tradition. Before it was built, Indiana practiced at Assembly Hall, where scheduling conflicts with the women’s program were just one of the issues keeping the program from landing top talent. These days, Indiana not only has its name brand and deep cultural connections in a basketball-obsessed (and talent-rich) state to entice prospects. These days, it has the bling to seal the deal. I think that’s a fair ranking. I could see us above UCLA, however, just do to overwhelming fan interest and the fact that IU basketball runs this university. It has no competition at the school, even with a top of the line program such as soccer. LA has so many other things going on that it loses some of the spotlight. 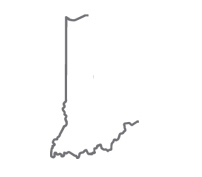 Here in Bloomington, if your running the ship right you are the King of Bloomington and surrounding areas, if not the whole state. Tom Crean, with Peyton Manning gone, is undoubtedly the King of Indiana. Yeah, seems about right, although I know I won’t be the only one to take issue with ESPN’s assertion that (the evil empire whose name should not sully this board) has the “best fans.” I can think of no definition of “best” that would apply to the BBN, unless it is arrogant, blind, hound-dog-like devotion. I know, not fair to hound dogs, who are, after all, capable of learning. Considering the states the 4 programs ahead of IU are from I find it hard for any of them being better than IU because of the elite in-state HS talent(teamed w/ Bloomington, AH and Cook Hall)IU can cull through for their roster. To me that should be the #1 criteria for this beauty pageant. I think they do a good job of pointing out that the top 5-6 jobs (they’re a little iffy on Duke long term) have very little seperation. While I agree that Indiana is one of the best recruiting areas in the nation, Indiana also has more competition with a historic in-state program at Purdue and Notre Dame and Butler as factors. Throw in OSU, MSU, Michigan, Illinois, UK, and a number of other strong basketball schools who recruit the area hard and are in close geographic proximity. Schools like UCLA in the West, Kansas in the Plains, and UK in the South don’t have a stiff a competition for the local guys in my opinion. Who’s a basketball power out west besides Arizona…a non-BCS school like Gonzaga or UNLV? For UK, what schools care about basketball in the South beyond Florida? Probably true in the day, but not so much anymore. Huge recruiting budgets, AAU showcases and social media have made the world a much smaller place. Competition for talent is no longer a just a regional concern. It’s national and, even, global. I know what you’re saying, though. Outside of UCLA’s inclusion in the Top 5, I think the Top 6 is a strong list. I believe that we could all argue on the order of the Top 5 (including Duke instead of UCLA). Each has its own points over the others. My issue is OSU’s inclusion at #8 over MSU. Are you kidding me? I think the assertion is that OSU has more money, and that the MSU job might not seem so enticing without Izzo there. North Carolina and Kentucky maybe a bit more glamorous than IU, but UCLA no way. They’re in a lousy conference, and most of the country never sees them play. They have no rivalries that in any way compare to IU-Kentucky or NC-Duke, and they do not occupy the same spot culturally in California that the other blue-bloods do in their states. A great, historic program, yes, but since 1975 mostly just a secondary power with little visibility outside the west. Indiana All Stars Senior Boys are gonna destroy KY! Incredible how good Remy was as a Freshman considering he was a 2 star recruit coming out of high school! He will be a great backup for Yogi next year, even if Remy’s not a true PG. I wouldn’t underestimate how much some guys want to play in front of friends and family, and for some guys a girlfriend factors in. But yeah, other guys are willing to go anywhere in the country. I’ve traveled southern California and if close proximity to top talent is an important advantage, it an easier ordeal traveling the state of Indiana than Los Angeles county. It can take 3 hours to travel from Lancaster to Long Beach and the same 3 hours from 1000 Oaks to Ontario. I would not want to recruit southern California. Being clear off the radar for 4 years(as stated in the write-up)has more to do with only being 5th and that is why I say we merit higher. Duke basically has to scour the country for players because they share a neighborhood with UNC, and they have to find guys who can meet the school’s academic requirements. UCLA’s a hell of a school, but I don’t think the requirements to get in are nearly as stringent as they are at Duke. Plus you have one of the deepest talent pools in the country, and let’s face it–recruiting against USC is a little easier than UNC. Local players for Kentucky are damn-near irrelevant. Manning means nothing to most of the people up here in Northern Indiana.